Red Lodge is a town with a past. It has seen mining, bootlegging, Calamity Jane, the Sundance Kid and Liver Eatin Johnson. Most of the downtown is on the National Register of Historic Places. Red Lodge lies where the high plains meet the Beartooth Mountains and landscapes still exist as Lewis & Clark saw them. The town is populated at 2500 and strategically located at 5500 feet elevation in the Beartooth/Absaroka Mountain Range and is considered to be the most beautiful entrance to Yellowstone National Park. 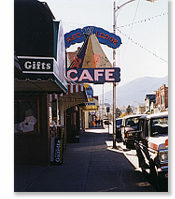 There are more restaurants per capita in Red Lodge, than any other town in Montana. Shoppers marvel at the fine offerings from unique shops and galleries. A shop till you drop experience awaits you. The Rendezvous Lodge is situated toward the south end of town in a private park like setting, just minutes away from downtown, skiing, hiking, golfing, fishing, rafting, mountain biking, rock climbing, or a visit to Yellowstone National Park. Red Lodge is great town, rich in history, rich in its people. It is a pleasure to walks its streets & sidewalks and meet the folks who keep its legacy strong. For more information about Red Lodge, visit the Chamber of Commerce site.